The star went to the Virgin Megastore in West Hollywood to pick up some DVDs last night at around 10:30, when she was stopped by the cops and her Bentley Continental GTC Convertible was towed away. Paris’ publicist, Elliot Mintz, tells that the heiress was exiting the parking structure which “is brightly lit so she had not noticed that her headlights were not activated.” As she drove a few blocks, she was confronted by other bright lights — those of the L.A. County Sheriff’s Department. 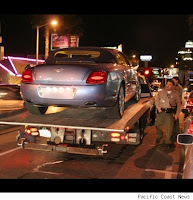 Paris was cited and her Bentley was impounded. Hilton ran down the street to The Standard Hotel Just one block down the street and she was seen partying there until the wee hours of the night.